In dealing with the custody of children it is very important and even very challenging to separate the co-parenting issues from the other issues between you and your ex partner. Shared custody or jointly parenting the children is difficult. When we talk about child custody, what do we mean? Let's start by defining some terms and concepts. Legal custody of children is a designation of the authority of parents to make major decisions regarding the health, education, maintenance and welfare of the children. To give some examples of decisions that need to be taken: Does the child need braces? What school will the child attend? What religion will the child practice? The two typical options when talking about for Legal Custody of children are either Sole legal custody, or Joint legal custody. A parent with Sole legal custody has authority to make all major decisions about the child. Parents with Joint legal custody share the authority to make major decisions about their children. Physical custody of children designates the amount of time the children spend with each of the parents. The two typical options that are often used are Sole physical custody or Joint physical custody. A parent with Sole physical custody of the children has responsibility the significant majority of the time. Parents with Joint physical custody of the children share responsibility for the child's time within a more balanced and equal schedule. Neither Joint physical nor Joint legal custody necessarily mean an exactly equal time-sharing arrangement. The particular needs of a given child and his or her family situation can be taken into account. The legal definitions of these terms have purposely been left general and broad by the legislatures. All time-sharing plans are to be based on very broad standards of “the best interests of the child” and need to take the children's development needs into account. Visitation as a term is generally used for the time children share with the non-custodial parent. It is the parent's obligation and responsibility to be available and to care for the children. We know that, with rare exceptions, it is in the children's best interest and right to have regular and continued contact with both parents. Especially for young children under the age of 4 or 5, because of their very limited memory. The children's rights have to supersede the parent's rights. Rather than using the terms “custody” and “visitation,” we prefer to use the more emotionally neutral term, “parenting plan.” Here we talk about the concept of children sharing time with or living with each parent at different times. The time sharing plan takes the parenting style and arrangement into consideration the children were accustomed to during the time of the intact relationship. 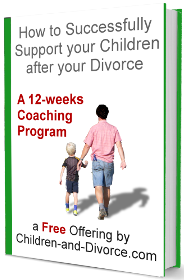 For the adjustment and stability of the children during the often chaotic and stressful period following the break up this is critical. If before the break up one parent was carrying out the major responsibility in time and effort, then this arrangement should remain the initial basis of a parenting plan. If the child shares time fairly equitably between the parents, then there is no need for this designation. We talk about co-parenting in any parenting arrangement, regardless of its formal designation. In every way each parent is involved in raising the child, the parent is co-parent. Effective co-parenting arrangements should contain the following characteristics: cooperation, communication, compromise, and consistency. These dynamics evolve over the years. Parallel parenting is more characteristic in a dysfunctional relationship, when there is an insufficient degree of cooperation, communication, compromise, or consistency to carry out co-parenting. In the early stages of a separation or divorce, parallel parenting may exist as a result of the lack of trust. Some parents are not able to work out these differences and remain in a struggle affecting all negotiations between them. Custody of children through parallel parenting often leads to heightened anxiety for the children during phone calls from the other parent and during transfers between parents. It is important to protect the children from potential conflicts. And minimizing verbal and physical contact between the parents can help. A third party can help with the joint custody communication process.